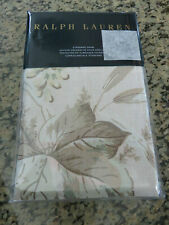 ROSE TREE DURHAM COLLECTION ONE EUROPEAN SHAM. 26" X 26" RN 126918 BRAND NEW!!! (On WHITE EGYPTIAN COTTON PERCALE. 1) KING SHAM. CLASSICGORDIAN KNOT. BLUE EMBROIDERED KNOTS. to keep my prices so silly low. Material: 100% Pima Cotton. Style Type: Pillow Sham. Includes: 1 Sham. Pattern: Quilted. Collection: Emblem. Machine washable. Manufacturer Color: Black. The Color of the real item may be a little bit different due to factors such as lighting / monitor resolution etc. Color: Ivory or cream colored. Shell: 70% Silk, 30% Polyester. Fill: 100% Polyester. Includes: 1 Sham. Care and Cleaning: Machine wash & Tumble dry. Textile Material: 55% Linen, 45% Cotton. Be sure to view all the photos for details of item. Thread Count: 100. Includes: 1 Oake Standard Sham. Color: Chambray. Each sham sold individually. Shell: cotton/polyester; lining: cotton. New Listing$115 Ralph Lauren Home Dune Lane Jamesport Standar Sham Grey/White Stripe 20x28"
New Listing$135 RALPH LAUREN Graydon Bold Stripe Euro Sham Dune/Indigo Cotton 26" x 26"
New Listing$130 RALPH LAUREN Metropolitain Grey KING SHAM RL 624 Solid Sateen 20" x 36"
Anthropologie Peacoc Alley Bradley White Euro Sham Nwot. Shipped with USPS First Class Package. 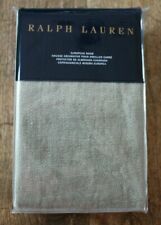 West Elm Ribbon Ruched KING Sham - New! Pillow shams can be used for decorating a new room or to give your bedroom an instant facelift. Cotton pillow shams and Euro shams are also used to protect the pillow from everyday wear and tear. Whatever the reason, shams are stylish and beautiful additions to bedrooms, and with the various colours, designs and styles available, you can give your room a new look. 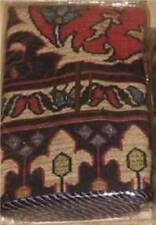 Shams are removable covers used to decorate pillows. Since sham means fake, they got their name because theyre false or external pillow covers in addition to or instead of a traditional pillowcase. The sham turns a standard white pillow form into a coordinating and often fancier bedroom accessory. Unlike cotton pillowcases, which are often white or simply matching the sheets folded under the covers, shams can be white, black, blue or a blend of these colours and more. They are usually designed to match the comforter or quilt on top of the bed, and many homeowners will use pillows with shams in addition to pillows with cases. Common designs of pillow or Euro shams are white and black stripes, blue and white florals, or solid black or white with lace or embroidery. For easy removal for laundering, shams have an opening in the middle of the back, whereas pillowcases open on the side. In what sizes are pillow shams available? Shams are made to coordinate with the different kinds of mattresses and pillows available, so the size varies. Shams can be separate or bundled with a comforter, pillows or bedding sets. Cotton and linen pillow shams generally come in the same size as pillows and may be quilted even if the bedding isn't. Whats the difference between pillow shams and Euro shams? European shams, also known as Euro shams, are decorative pillowcases used to enhance the beauty of your room. The difference between them is that Euro shams are square whereas regular shams are rectangular. Euro shams may be found in floral, print, or stripe designs using mixtures of white, black, blue, green and other colours. Both types will coordinate with linen or cotton bedding collections. Do pillow shams come in standard styles and colours?